We deliver in Fife and Edinburgh 6 days a week, Monday to Saturday. When you order please put in your preferred delivery date, if we won't be in your area on that day we'll contact you to arrange a different date. Please note - delivery is only available to UK mainland. No delivery available to Islands or Northern Ireland but this is something we are working on improving so that we can service these areas in the future. We offer a dedicated delivery service in Kirkcaldy, much of Fife area and Edinburgh at a cost of £3 or £5 depending on location. For our customers further afield we can organise a courier service. Place and order for £50 or over and receive a £3 discount on your delivery charge. We endeavour to dispatch your order to arrive on your requested delivery date, however dependant on availability of products that may not always be possible. It is possible to arrange for a Saturday courier delivery but please phone the office to arrange this rather than placing your order on the website as there is a significantly higher courier charge and we would need to make special arrangements. If you wish to order further in advance please select your preferred delivery date at checkout. All our meat is clearly labelled and vacuum packed to ensure its superb quality is not lost. The beauty of vacuum packing is that the meat can be kept fresh if refrigerated for up to two weeks. The vacuum packed cuts are packed into chilled polystyrene boxes before being sent to our customers by courier on a next day delivery. This also means that home freezing is easy - just put the packs you do not want to use within the next few days in the freezer. Once defrosted, the meat is of the same exceptionally high quality as the day it left us. Click and Collect orders can be collected within the opening hours of your collection choice – just select your preferred pick up date at checkout. Click and Collect is generally available throughout the week at 24hours notice, however all orders for weekend collection must be received by Thursday morning. 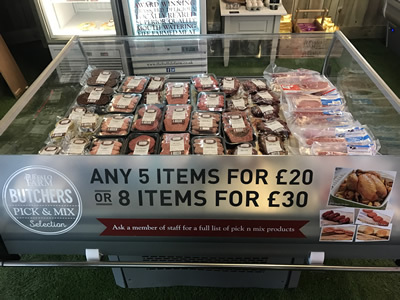 If ordering for same-day collection, or on a Friday for collection on Saturday, please contact the shop directly on the number below and our butchers will do their best to meet your needs. We always endeavour to match customers’ orders but sometimes this is not achievable and a similar product/weight/value may be substituted to complete the order. If your order is incorrect or damaged, please call or email us and we'll do our best to rectify any problems as quickly as possible. Please inform us as soon as possible of any items incorrectly supplied. We will arrange collection and either provide a refund to the same payment card as used to place the order or supply the correct item by return. If the products received are defective or damaged we will offer a replacement or a full refund (including postage costs). Please note that goods must be returned before the Use By date. You can cancel your order up to the point of despatch. If you are not completely satisfied with any products you receive from the Buffalo Farm please tell us and we will either replace the product or refund you the purchase price.